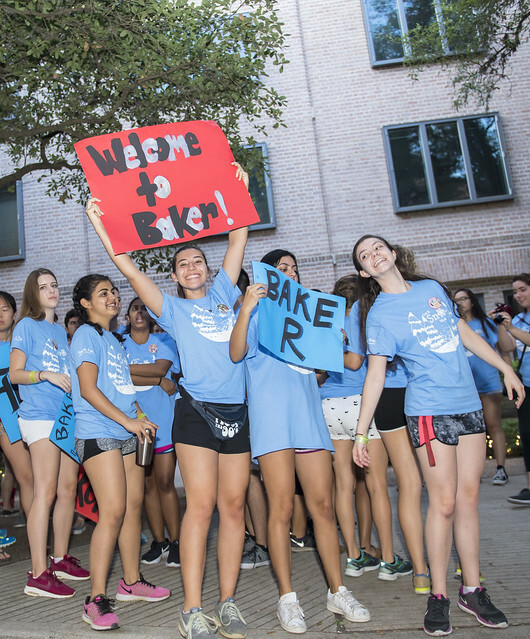 It takes a lot to get college students out of bed before dawn, but Aug. 13 was a special day — a day for which Rice University’s student advisers for O-Week had been preparing for months. McMurtry College students welcome Rice’s Class of 2021. Photo by Tommy LaVergne. O-Week is the weeklong orientation program designed to familiarize incoming first-year, transfer and foreign exchange students with their new campus, residential colleges and classmates. In the months leading up to the Aug. 13 kickoff of O-Week, the student advisers collaborated to come up with orientation residential college themes and to memorize the names and details about the incoming freshmen. Their hard work paid off during move-in, when they rushed to arriving cars to greet incoming students by chanting their names and helping unload their belongings, which gave parents a chance to spend a few last precious moments with their children. Miranda Lee, an O-Week adviser at McMurtry College, said that the advisers all share a huge enthusiasm for O-Week and for creating a welcoming experience for the incoming students. It’s this dedication from students that makes O-Week possible, Lee said. “We want to give the new students the same kind of experience we had,” she said. Lindsay Josephs, an incoming Duncan College freshman from Connecticut, was very appreciative of the warm welcome. New freshman Brian Tumusiime (center right) from Rwanda meets advisers and magisters at Jones College. Photo by Tommy LaVergne. Brian Tumusiime, an incoming international student from Rwanda and new member of Jones College, decided to come to Rice because of his involvement with Bridge2Rwanda, an organization dedicated to creating opportunities for Rwandan students to study abroad. After evaluating his interests and character, Tumusiime’s counselor in the program suggested he look into Rice. Tumusiime liked what he saw and decided to apply, and the rest is history. Several months after his acceptance to the university, he boarded a plane for his very first trip to the United States. “It’s very beautiful here and very fun. It’s also very hot — but I really like it.” he said with a smile. Riya Mehta, a new Wiess College freshman from Wisconsin, said she chose Rice because from her first visit, she liked everything about it. After saying goodbye to their parents and enjoying a day of activities with their new classmates, the new students attended the annual matriculation ceremony, where university leaders formally welcomed them to campus. Rice’s Class of 2021 at the matriculation ceremony. Photo by Jeff Fitlow. He then introduced Rice President David Leebron, who urged the incoming class to interact with one another and seek to appreciate the differing viewpoints that arise from those interactions. “As members of a community, we do not undertake to agree with each other, but instead to engage with each other, to respect each other, to try to understand each other’s perspectives and to learn from each other,” Leebron said. Justin Onwenu, president of the Rice Student Association, encouraged the incoming students to expand their Rice experience outside of the hedges and to take advantage of the ample learning opportunities available to them in the nation’s fourth-largest city. Some of Rice’s new students react to the display of fireworks on the quad after walking through the Sallyport. Photo by Jeff Fitlow. Association of Rice Alumni President Matt Haynie ’03 wrapped up the formal remarks for the evening by encouraging the students to do three things: Think about how their time at Rice would help them make the world a better place, make the best friends they had ever had and not forget their responsibility to Rice and their fellow Rice community members. “We need you to start recognizing today that Rice would not be the incredible place it is unless everyone in our community — most especially our students and our alumni — is engaged in supporting each other and the university so it can be the best it can be,” Haynie said. New members of Hanszen College walk through the Sallyport following the matriculation ceremony. Photo by Jeff Fitlow. 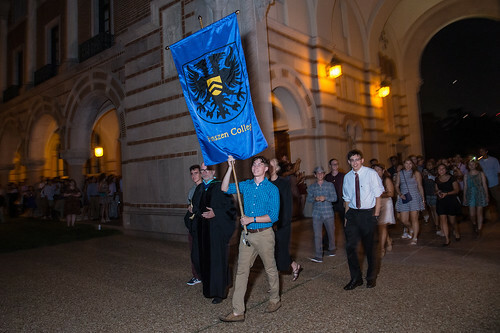 After singing “For Rice’s Honor,” — the Rice school song, students exited Tudor Fieldhouse and walked along a candlelit Inner Loop toward the Sallyport, the arched passageway in Lovett Hall that leads into the Academic Quad. As each college approached the entryway, a hush fell over the crowd waiting on the other side; as each group of freshmen marched through the Sallyport, the crowd erupted in screams and cheers for the students and a dazzling display of fireworks exploded in the sky. According to Rice tradition, students should not pass back through the Sallyport in the direction of Founder’s Court until their day of graduation — otherwise, they won’t graduate on time. Hannah Andersen, a new Lovett College freshman from Texas, said the day’s events — everything from the warm welcome in the morning and assistance moving into her dorm room to the matriculation speeches and fireworks that concluded the evening — were very exciting. Fireworks explode over the Academic Quad. Photo by Jeff Fitlow. “It made me feel like Rice really supports the happiness and well-being of all their students,” she said. Armando Amigon, another Lovett College freshman from Illinois, said he really enjoyed the day’s events and especially liked Leebron’s remarks about the inclusive nature of the Rice community. “I’m a Rice student now,” he said, smiling. A full roundup of #RiceOWeek17 coverage is available online at https://storify.com/riceuniversity/riceoweek17.